I am a white girl. So white, I am almost translucent. Almost every item here applies to me. I am an accountant and exhibit most traits associated with accountants (except for attention to detail, oddly enough. That has proven to be a bit of a hurdle, in my career). The term “vanilla” has been used to describe me, by trusted sources. I disagree with this assessment, but deep down, I know it isn’t that untrue. Two years ago, I joined a boxing gym, located in downtown Montreal, in an area that is slightly rough (future posts will elaborate on this). I love this gym. It is fabulously gangsta. It is located in a dank basement, and upon entering the staircase that leads to it, the only sounds that can be heard are the sound of the timer’s bell, the punching bags being hit, and hip-hop music that is so authentic, I don’t recognize any of it because it doesn’t play on mainstream radio. I am a visible minority at this gym. There are only 3 other white people in my class (of about 20-25), and of this sub-group, I am the only one without a tattoo. (See? vanilla!!) The diversity of this gym is what appeals so much to me: every ethnicity is present, as are every possible career and lifestyle – a true Montreal mix! A few of my teammates took pity on me, after I confessed that I had only discovered Jay-Z & Eminem’s song “Renegade” (released in 2001) at the gym, in 2013. One teammate in particular, Nene, has taken me under his wing, and is attempting to teach me how to be more gangsta. One day this summer, Nene told me to add “ratchet” to my vocabulary. I found this in Webster’s English Dictionary. I dutifully memorized this word. And yet, for weeks, I was unable to find a suitable occasion to use it. 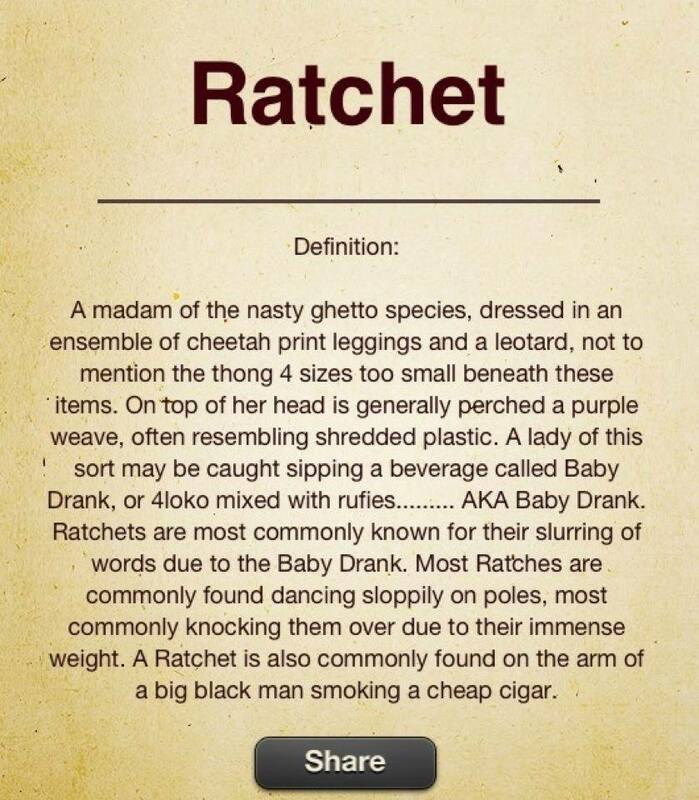 One day, over drinks with some of my accountant friends, I confided to them my struggles over the term “ratchet”. I did not foresee the consequences of my actions. Nene must be proud of his legacy. I am a quick study. ← First blog post – setting the bar high! Ratchet is a sexist term. It is not used against males, as a rule. It seems we don’t have enough terms of insult for women–we must keep inventing new ones. I would, perhaps, take no issue if we did the same for men. I am by no means an expert on ratchetness, clearly, but I have mainly used it to describe situations or things/places. Less as an adjective to describe people of either gender. Maybe thats how it is used in Canada? Naw, I admit it’s used that way here, too. But it was used more to describe young women. Vine had a whole mess o’ vines about ’em. Funny? Some. But still wholly, sexistly obnoxious.